Standardized Cheating Scandals In Atlanta And Dougherty School Systems; New Evaluations; Re-districing In Atlanta; Gangsta School Systems; Training For Cobb County’s Rambunctious School Board; Treating Motivational Breakdowns As If They Were Technical Breakdowns; Educational Sluts & Pimps; And Other Holiday Potpourri! | Georgia Teachers Speak Out! ← Some Thoughts About Discipline, Bill O’Reilly, Rotten Teeth, And Public Education. Let’s Call It A Thanksgiving Potpourri! Standardized Cheating Scandals In Atlanta And Dougherty School Systems; New Evaluations; Re-districing In Atlanta; Gangsta School Systems; Training For Cobb County’s Rambunctious School Board; Treating Motivational Breakdowns As If They Were Technical Breakdowns; Educational Sluts & Pimps; And Other Holiday Potpourri! Editor’s Note: The following comments by Dr. Trotter were written recently, and most of them were written on The Atlanta Journal-Constitution‘s Get Schooled blog. 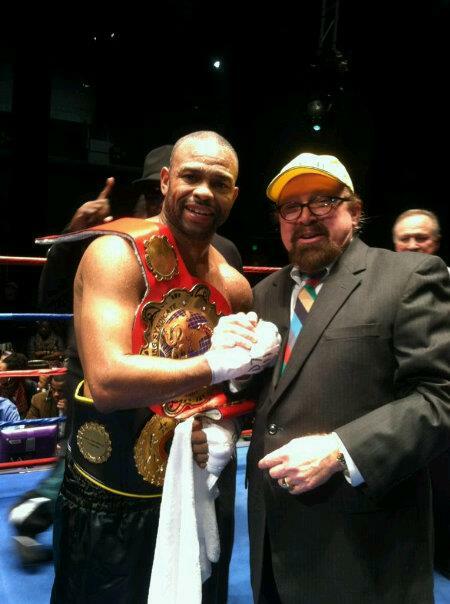 Dr. Trotter recently in photo with boxing legend Roy Jones, Jr.
A Nation at Risk report which was published amid great fanfare in 1983 ushered in nearly 30 years school reform disasters. You cannot mandate school reform nationwide, statewide, or system-wide. No far-reaching school reform has ever worked. Never. Dr. John Goodlad’s mega-study of the studies clearly revealed this even in the early 1980s. (Dr. Goodlad’s findings were published under the title, A Place Called School.) Dr. Goodlad was associated with UCLA. All the hype of school reform is just that….hype. Improvements can indeed occur at the individual school level, with a secure and confident leader who does not suffocate the teachers but frees them up to teach…and supports them in disciplinary matters with the students. © GTSO, December 21, 2011. APS. Always Pushing Sh-t, right? Beverly Fraud, you are right on target about the phoniness of the threat to lose accreditation. SACS was NEVER going to take away accreditation. It appears to me that Mark Elgart works in concert with the big shot business leaders. SACS is used as a tool to try to determine who will be the leaders on the various school boards. See Clayton County where SACS and business leaders favored Ericka Davis but were apparently afraid of Norreese Haynes and see Atlanta where SACS and business leaders favored Butler-Burks but were apparently afraid of Khaatim El. Asking too many questions made the business leaders nervous. School systems have become huge money bonanzas for the business community to exploit, and the big mules in the business community need very compliant superintendents and school board members to pull of their “heists” of the public monies. El and Haynes were in their way. All of this talk about doing everything “in the best interests of the children” is just blather. What is done is done in the best financial interests of the select few. Check out who owns the properties being sold to APS for the new Buckhead high school and other schools. I can assure you that Inman Middle School and Kennedy Middle School are not in any way the same. I am very familiar with both schools. Let’s face it: You have good schools, O. K. schools, and chronically failing schools. Kennedy Middle is a chronically failing school. What parent in his or her right mind wants his or her child to attend a chronically failing school where fighting, bullying, cheating, and drug selling abound? No matter what Brenda Muhammad or Erroll Davis say to try to mollify the parents whose children are going to be shipped to these chronically failing schools will work. Parents will be mad. Pure and simple. Mad. You can’t improve these schools by shipping “good students” to them. Like Beverly Fraud has right stated, the first thing that you have to do with these chronically failing schools is to establish order. Order is the first law of the Universe. Without an orderly and disciplined environment established, no academic achievement will occur. Order and Discipline First. Academic Achievement Second. The order cannot be reversed. Now when some of the more affluent parents’ children may be affected by dumb decisions from the school boards or from educrats, our theories make sense. But, as long as their children are ensconced in affluent neighborhoods and their schools are granted inordinate autonomy, their voices were mute when it came to a lack of discipline, bullying, fighting, and systematic cheating in the schools in the rougher areas of town. Hmm. This tinkering with the evaluative process is a complete joke. It is all based upon the assumption that the problem in the public schooling process is the lack of teacher quality. Ha! The problem? The lack of student quality. Many students come to school with little or no motivation to learn and then these non-learners are allowed to disrupt the learning processes of those students who have a desire to learn. Our educrats are unfortunately idiots when it comes to what works in the public schooling process. What works? First, discipline. Without it, you will not have ANY academic achievement. None. The educrats want to ignore the 800 pound gorilla in the parlor knocking over all of the nice marble-topped furniture. It’s the discipline, stupid. It’s not about teacher quality. Sure, there are a few weak teachers, just like there are a few weak lawyers, physicians, dentists, engineers, et al. But, the overwhelming problem is the low quality of today’s students. Don’t blame the dentists when the patients come to the dental office with rotten teeth, especially when the patients refuse to brush their teeth or to engage in any other preventive treatment. This notion of blaming the teacher is like sending the dentists through many more evaluative processes because his or her patients come to his or her office with rotten teeth and refuse to follow his or her instructions. Stupid! Our educrats always want to treat a lack of learning as a technical breakdown which can be fixed with more teacher workshops or more stringent evaluative procedures. Oh, how stupid and pitiful is this thinking, but it is self-preserving thinking. It keeps these educrats employed. The best thing that we can do for public education is (1) restore order and discipline in the schools; (2) remove the non-learners from the regular learning environment; and (3) get rid of all of the educrats. The motivation to learn is a social process or culture phenomenon. You cannot have good learning conditions until you first have good teaching conditions. If a student is not motivated to learn and refuses to learn, not even Arne Duncan, Nathan Deal, Barack Obama, Michelle Rhee, Beverly Hall, Rod Paige, George W. Bush, Henry Kissinger, Dwight Howard, John Barge, Tim Tebow, Rod Stewart, George Jones, or Herschel Walker can make this student learn. Motivation to learn is the key. It’s not a technical breakdown; it’s a motivational breakdown. Pure and simple. Our educrats don’t want to know this. They enjoy driving their BMWs. If it were as simple as I am saying, then why do we need these useless educrats? Ha! Get rid of the educrats! I have written extensively on this for years. Right on point. This whole public schooling process quit being about the kids long ago. It’s about the big fat salaries of the educational sl-ts (superintendents) and their pimps (school board attorneys). It’s about money, and the due process procedures get in the way. They want to just heartlessly get rid of anyone who questions anything, despite how good a teacher he or she may be. They want to keep a bunch of non-tenured teachers around and expect them to jump through a zillion hoops and make it look to the naive board members that the superintendent-attorneys are doing something. There has been an unholy alliance established between appointed superintendents and school board attorneys (especially those who also act as “search” firms). A very unholy alliance. The Pimps and their Educational Sl-ts. These Educational Sl-ts jump in and out of school board beds, depending on how much they will be paid. Of course the Pimps get their share of the bounty too. @ April: Are you sure that you don’t work for the educrats — or better yet, for one of the Educational Sl-ts (appointed superintendents) or for one of the Educational Pimps (school board attorneys)? Why such a visceral response? The blog is for anyone who cares to post. It’s just digital space. No waste of paper. Very environmental friendly. Maybe you just can’t handle the “same” people’s arguments. It is plain stupid and non-sensical to blame teachers for students’ lack of effort. Plain stupid…but politically convenient for the politicians, policy-makers, and educrats. I am sorry, April, but I will continue to point out the stupidity and hypocrisy…and I am still open for a public debate on these issues from Mark Elgart, Erroll Davis, Edmond Heatley, Glenn Brock, Beverly Hall, or any other superintendent or school board lawyer or educrat in the State. How can I be more accommodating? Ha! The biggest lawbreakers around? The school systems. They just hire the law firms (pimps) who will, for the right price, apparently tell them that they don’t have to follow certain laws. Superintendents (the Educational Sl-ts) love to hide behind school board attorneys (the Educational Pimps). The grievance law (O. C. G. A. 20-2-989.5 et seq. ), the ten day rule for holding a hearing for suspended educators (O. C. G. A. 20-2-940[g]), the duty-free lunch law for elementary teachers (O. C. G. A. 20-2-218), the sick leave law (O. C. G. A. 20-2-850), etc. Heck, the Atlanta Public School System violates all of these laws. All of them. Other school systems (Cobb, Clayton, DeKalb, Fulton, and others) also routinely violate State Statutes and Federal Laws. Routinely. They are, in my opinion, gangsta school systems. Some are worse than others. We at MACE have to continuously hold their feet to the fire when it comes to protecting the rights of MACE members. These school systems are thugs, bullies, gangstas. I am just telling you the unvarnished truth. And they apparently think that it is O. K. to violate laws because their school board attorneys apparently give their imprimatur to do so. I am amused that the Cobb County Board of Education is now going to have to undergo “training” on statutes on Open Meetings and/or Open Records. The board is not admitting that it has violated these laws (but it has on many, many occasions), but Sam Olens, fellow Cobb Countian and now Attorney General of Georgia, is telling this rambunctious school board that it needs “training”? What about “training” from the Brock Clay law firm, the firm which has apparently made millions and millions of dollars from this school board? I have been telling you folks for years that it is all a game. A sham and a farce. It’s all about the cheddar. @ HS Public Teacher: It is stupid beyond comprehension. These folk always learn dumber. I have been keenly observing this for nearly 35 years. They don’t have a clue but want to impose their clueless mandates on professional educators…simply to realize a few years later that these mandates not only did not improve education but even made it worse. 1 Response to Standardized Cheating Scandals In Atlanta And Dougherty School Systems; New Evaluations; Re-districing In Atlanta; Gangsta School Systems; Training For Cobb County’s Rambunctious School Board; Treating Motivational Breakdowns As If They Were Technical Breakdowns; Educational Sluts & Pimps; And Other Holiday Potpourri! Educ-RATS’ craving for cheddar is obsessive. So long as we teachers cowardly acquiesce in these rodents’ compulsively gorging themselves on cheddar better-spent on instruction and instructional-support, GA educ-RATS will continue to chew away to the detriment of our kids and our future.